Starched white lab coat. Check. Razor sharp knife. Check. If we were playing “Who am I?” you might guess that I earn coin as a butcher. The truth is though I am a catering assistant, the role that toes the line between skivvy and sous chef. My days are spent prepping vegetables, making sandwiches and putting together deliciously colourful trays of fruit salads. The work of a catering assistant varies greatly depending on the company you work with. I gained my experience within an airline catering company which has ensured long stressful days with stringent timeframes and last minute orders. It is an unpredictable role as changes in flight patterns impact on a typical working day. It is not unusual to start at 5am to ensure lunch flights are catered for or stay a couple of hours late to prepare a spread for hungry passengers on a delayed or diverted airline. A typical day features blood, sweat and tears; my hands have many a time been victim to the blade. I have come up with a few pros and cons so you can weigh up if being a catering assistant is for you. It is a great job if you want to work with food but not have to deal with the customer directly as is the case with most hospitality jobs. Working with food offers the obvious appeal of being able to sample a wide range of different cuisines. Of course you should check first with your employer but generally a perk of any tucker related role is to taste the tucker! Con – Food Glorious Food! The flip side of working with yummy food is working with yummy food. Diets go out the window for a start. It is hard to stick to the paleo diet when you are taking freshly baked soda bread out of the oven. Coming to work with a hangover is also a big no no. Surrounded by the different smells and sights of the cuisine can be a little nauseating at times. Becoming a catering assistant can give you insight to the life of a chef, obviously on a smaller scale. 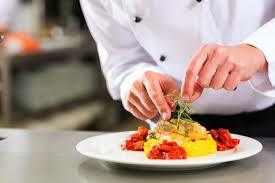 You will often work alongside chefs or at minimal level complete tasks that are part of a culinary professional’s job. Gaining knife skills and exploring your sense of creativity are just some of the bonuses of this career. Becoming a catering assistant is not for the faint hearted. As I described earlier, the working environment is usually quite pressurised and can sometimes become monotonous. It is hard to have extreme pride for a beautiful looking sandwich you have made when you have already made 300 of them. Also, in the airline catering industry anyway, the “office” can sometimes feel at bubbling point due to the stress levels. As we work quite closely with transport and they are in contact with cabin crew, any grievances that transport receives are often relayed back to the kitchen crew. The atmosphere can be fraught so it is of benefit if you are level headed. Working as a catering assistant for airlines offers a window into the world of a variety of cuisines. Not only that but I work with a diverse mix of people from many different cultures. The chefs range from Aussie to Indian to Filipino each specialising in their own type of foods. Working with a multitude of nationalities is both rewarding and educational. I am a firm believer in trying new things and I think playing catering assistant is a must even for short spell. It is a role that is portable and can take you around the world. It also offers a great sampler into the world of a chef without the commitment.